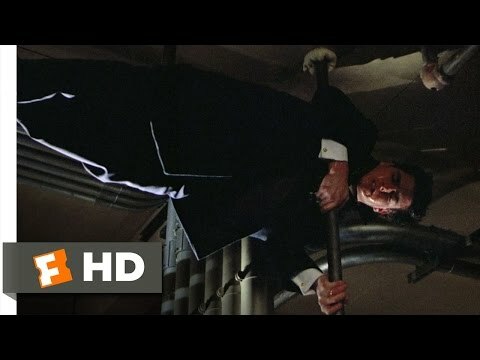 Mitch (Tom Cruise) gets trapped in a building, but finds a way to escape being killed by Devasher (Wilford Brimley) and his hit man (Tobin Bell). In this drama, based on the best-selling novel by John Grisham, Mitch McDeer (Tom Cruise) is a young man from a poor Southern family who has struggled through Harvard Law School to graduate fifth in his class. Mitch is entertaining offers from major firms in New York and Chicago, but when Memphis-based Bendini, Lambert, & Locke offer him a 20 percent higher salary than the best offer he's received, in addition to an enticing variety of perks and fringe benefits, he decides to sign on and remain in the South. Mitch's wife, Abby (Jeanne Tripplehorn), warns him that the deal sounds almost too good to be true, but it's not until after several weeks of working with Avery Tolar (Gene Hackman) that Mitch discovers that the vast majority of BL&L's business is tied to organized crime, with crime boss Joey Morolto (Paul Sorvino) using the firm to launder Mafia money. FBI agents Wayne Tarrance (Ed Harris) and F. Denton Voyles (Steven Hill) try to blackmail Mitch into helping them make a case against the firm, while BL&L's "security director" William Devasher (Wilford Brimley) is blackmailing him to do as he's told after Mitch foolishly allows himself to be seduced by a prostitute hired by the firm. The Firm was adapted for the screen by acclaimed playwright David Rabe and features performances by Hal Holbrook, Holly Hunter, and Gary Busey.